One thing I’ve noticed about shopping on the web — more sellers find you. 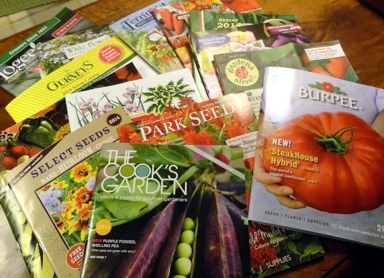 Since the beginning of December I’ve been receiving two or three seed or plant catalogs a week, many from companies I’ve never heard of.The plant photos and descriptions are all so enticing. The coming season’s catalog offerings. How can a gardener choose between all the varieties of lettuce available? What about all those beans! It’s dizzying. I keep a list of all the vegetable seed types I buy, not that it does much good. By the end of the season when I should be recording a review on each seed, I’m too busy canning, freezing, or drying. Last year I grew kohlrabi for the first time. Family likes it as well as potatoes as a side. This winter has been so very busy and my cold has drug me down, so I haven’t perused those catalogs as much as I’d like, but I’ll have my orders in by the end of February. the thought of getting into the garden again helps me get through these sub-zero temperatures we’ve been having.